This upper level grammar series, from Christian Liberty Press, will enhance your students' grammar and vocabulary skills. Applications of Grammar Books 1-6 are designed to develop the students' skills in using the rules of grammar to communicate effectively for the glory of God. Students will study such topics as sentence structure, identifying parts of speech, spelling and vocabulary, developing writing skills, and much more. Each year of Applications of Grammar includes review of what has been learned. Daily Grams provide a daily 10-minute guided review of sentence structure and English grammar. 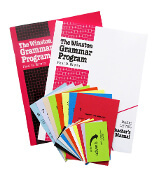 There are 180 worksheets in each book, designed for one review session at the start of each school day, leading to the mastery of grammar skills! Recommended by 100 top picks. Click here to view an introduction to Fix It. Because every book in Fix It! Grammar is foundational to the book after it, our recommendation is that all students begin with the first book: The Nose Tree. Each book includes advanced concepts, so even if your student knows much of the material, you can still begin with the first book and plan to move through it at a faster pace while adding the advanced concepts as he is ready for them. However, if you think your student has already mastered some of the concepts, use our placement test to determine where to start. This series covers English for high school students. The four books are short. Each contains 19 daily lessons. Since each lesson contains so much material, doing these four books once a year during your high school years would be a really good idea. The purpose of The Winston Grammar Program is to help students understand the structure of language and comprehend the principles of traditional grammar. The Winston Program uses innovative means to achieve conventional ends. It does away with the traditional grammar textbook, lecture approach, and heavy emphasis on memorization. moving, seeing, speaking, hearing. Repeated use of the cards results in the students' acquisition of knowledge with little or no memorization required.